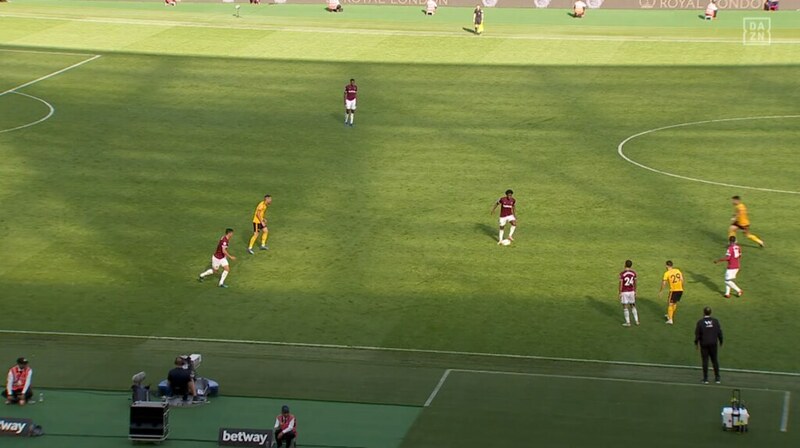 It was picked up on GOS analysis that Cresswell could have 'taken on for the team' and fouled Traore out but made a half arsed attempt to do so. It would have been cynical and second yellow but sometimes needs must. I'm sure cresswell replays that in his head and thinks why didn't I take him out? It's not easy to make that decision in a split second. Because that's all he had before Traore was gone. He knows he's off if he does it and gives them a free-kick on the edge of the box. goa127 wrote: I'm sure cresswell replays that in his head and thinks why didn't I take him out? It's not easy to make that decision in a split second. Because that's all he had before Traore was gone. He knows he's off if he does it and gives them a free-kick on the edge of the box. I appreciate that but it was his totally non-comiitted attempt he made. He ****ed his leg out with no real intent. My biggest gripe with their goal is the game management of it all. Exactly this. It's the 93rd f...ing min, we play out the remaining min and half and get our first point of the season, that is the professional way, but for some reason all but three of the team are ahead of the ball, like a Thursday night five a side team that has just called "next goals the winner" and against two of fastest players in league, amateur hour madness. Tactically we played to Wolves strengths and exactly what I warned against on Friday in this thread, if we dont cover Costa or Traore we will loose. I don't think Pelligrini has a clue, he claims he watched all our games last season, well if that's so he will know that for half the season Arnie was awful, only when Moyes played Lanzini or Mario as a supporting ten to his centre forward did he begin to shine, so what does Pell do? Plays him up top on his jack with Anderson miles off him. And what's all this bombing players out of the squad? With the pace that Wolves had on their right we must start Arthur, he has the raw speed and they know that. They also know that if they work to get Costa or Traore into a foot race with Cresswell they are going to get a dividend, and so it proved. I can understand why we played it short, I do not agree with it, but i do understand it as that is clearly what we are being told to do as a team. Plus Sanchez had more than enough space to play. Shows just how much time and space Sanchez had, if anything he had too much. Even at the point of him being shut down he just had to roll the ball out/back to Diop. 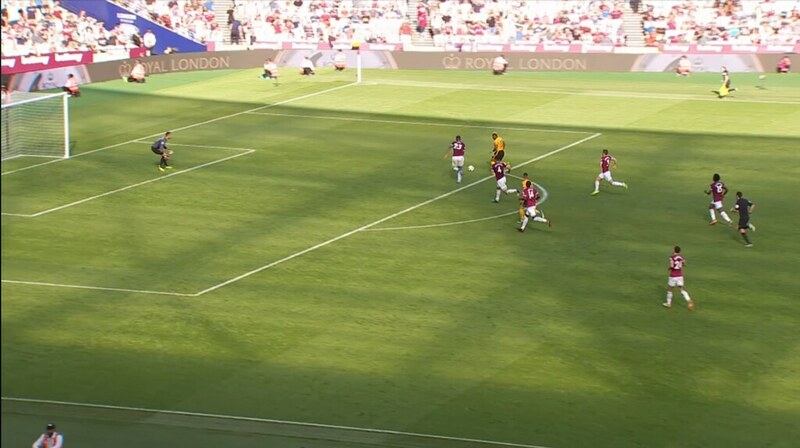 Not sure that a keeper should be beaten at the near post from here either, but it was a good strike so full credit to the striker I guess. Looking at them both, at the time he shoots, it is no better a chance than Arnautovic had just a few minutes earlier, and he nails it. JUST ROLL IT IN THE F****** CORNER...!!! we have FIVE outfield players in our own half when we take the kick. Add the goalie and that's of course SIX. sutts07 wrote: I can understand why we played it short, I do not agree with it, but i do understand it as that is clearly what we are being told to do as a team. what are we possibly going to gain by playing it short? 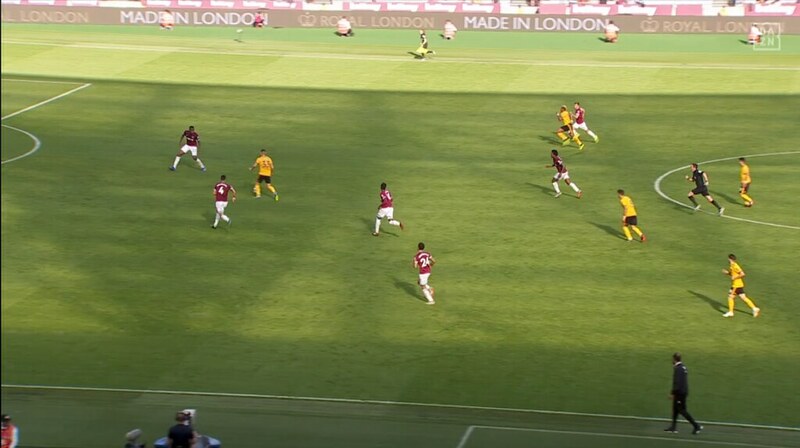 was the plan to get it wide to Cresswell to sling into the box? 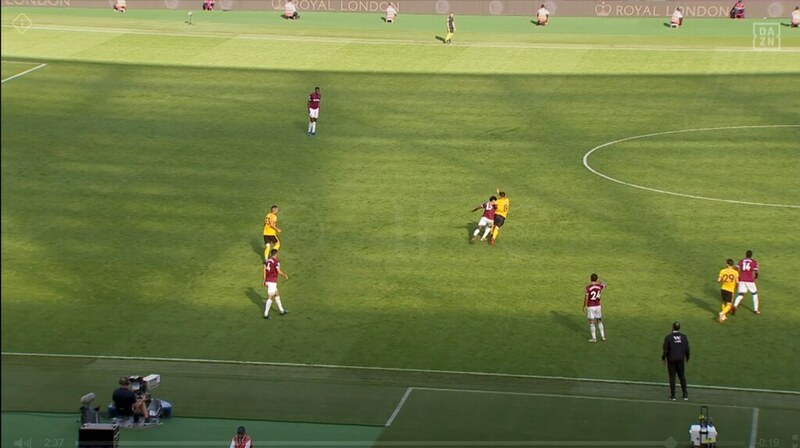 If that was the case then why didn't Balbenua just play it straight to Diop and go from there? Why not just take a bit of time off the clock, send a CB up and boot the freekick in the box? Sutts, on that first picture you can see Jimenez is blurred because he's already set off towards Sanchez. Without doubt, Sanchez should have done better there but I don't think it was the wisest idea to pass to him in there. 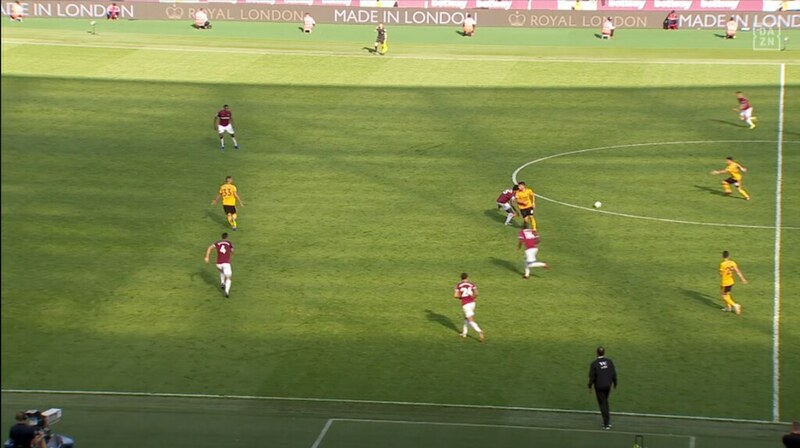 I thought at the time Wolves looked ready to press in there. He cleared the keeper's arms and beat him, but it hit him square in the head. 9 times out of 10 it breaks the back of the net and the finish looks emphatic. didn't Fabianski make an equally good save from them or it would have been another "emphatic finish ?" wizzo_66 wrote: Arnie was very unfortunate. Not unfortunate at all. He lacked composure and just put his foot through it. It should not have been anywhere near the keeper, the keepers arms of the keepers face... just roll the ball into the corner and win us the game. Cuenca 'ammer wrote: other than that did we trouble their keeper ? Snodgrass should have done better in the first half, their keeper made a good save at his near post but we didn't get the corner. Antonio should have done better with his chance at the near post. He could have also done a bit more with his header 2nd half that just looped towards the goal. 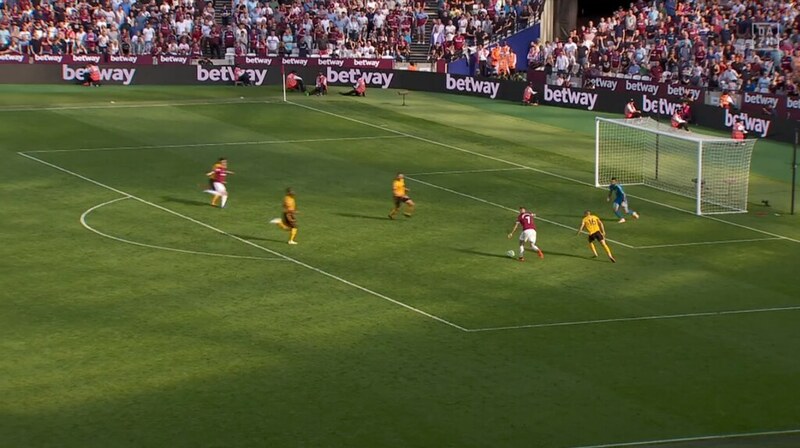 They had one good header from a free kick straight at Fabianski, one break (that looked yards offside) that Fabianski rushed out to block, one ball into the box which their forward fell over and then the goal. It was fairly even on chances. I'm not making a case for us winning the game. Just saying that particular chance Arnie in my opinion was unfortunate as that type of finish is more than adequate enough most of the time.